16-storeyed government twin tower to come up in Tulsi Nagar: Minister Shri Verma. A 16-storeyed government twin tower will be constructed by the Public Wordks Department near the MPEB office in Tulsi Nagar, Bhopal. As many as 64 D-type houses will be constructed for government officers in the twin tower. The construction work will begin in the onth of February. Public Works Minister Shri Sajjan Singh Verma said that the Congress has promised in the party manifesto to build multi-storeyed buildings after demolishing the old government houses to resolve the housing problem of government employees. Accordingly the twin tower is being constructed in Bhopal. There will be all modern facilities in the 16-storeyed twin tower government quarters which will come up at a cost of Rs 38 crores. This twin tower will be completed in about 18 months.The project implementation unit of the Public Works Department has reserved 3 acres of land for construction of the building. There were ruins of 16 government houses lying vacant since several years on this land which has been razed and the land has been prepared for the construction of the twin tower. The twin tower will have parking facility in the basement and ground floor. The building will be built with earthquake and fire resistant material and will also have lift facility. All parameters of the green building concept will be adhered to in the twin tower. The tower will have maximum natural air and light facility. Arrangement has also been made for adequate open spaces in the residential premises. 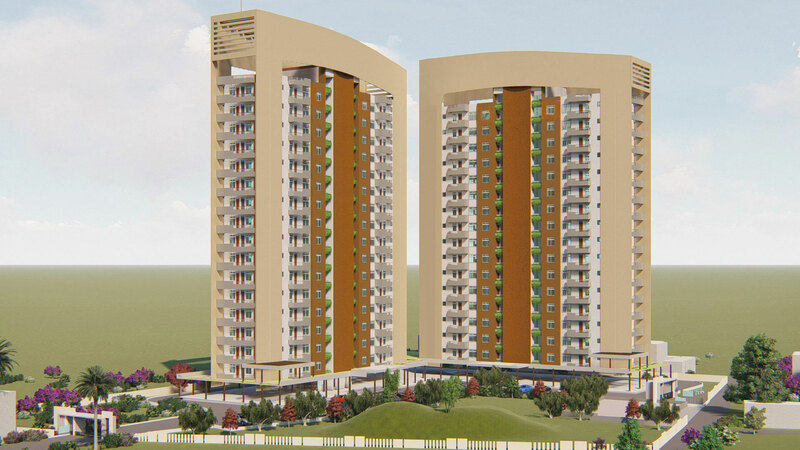 Four 16-storeyed towers to come up in Indore also In Indore also, the project implementation unit of Public Works Department will construct 4 towers of 16 storeys to solve the housing problem of government employees. There will be 66 E-type and 66 F-type houses in these towers. The bhoomi-pujan for the construction of the four towers is also proposed to be in the month of February. The towers will be constructed at a cost of Rs 70 crores. The project implementation unit of the Public Works Department will construct multi-storeyed buildings for government employees in Jabalpur and Gwalior also on the same lines. Amarkantak to be made Mini Smart City by Spending Rs. 155 Crore: CM Shri Chouhan. Chief Minister Shri Shivraj Singh Chouhan said that Amarkantak will be transformed into a Mini Smart City. An amount of Rs. 155 crore will be spent on this work. He further mentioned that a cheerful life cannot be imagined in Madhya Pradesh without Narmada. 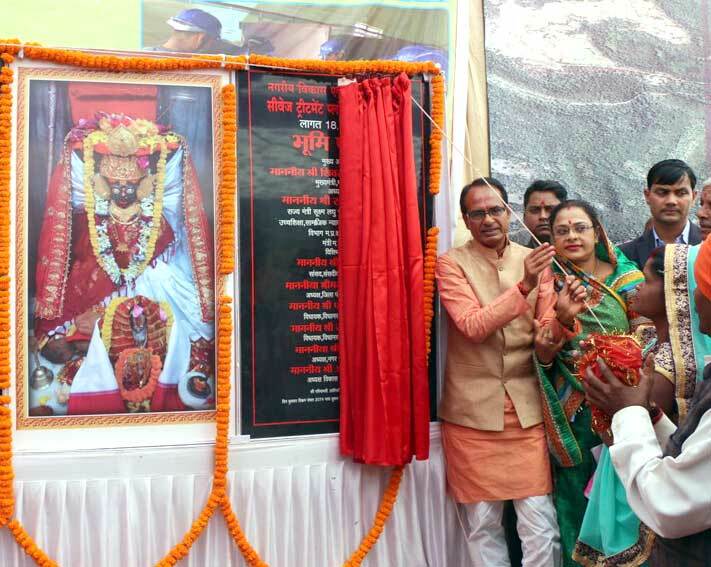 Shri Chouhan was addressing the large public gathering in a programme held at Ramghat of Amarkantak of district Anuppur. Shri Chouhan performed bhoomi poojan of water supply scheme costing Rs. 12 crore 56 lakh and sewerage plant costing Rs. 18.50 crore in Amarkantak. He also made announcement for providing Rs. 5 crore towards sanitation and infrastructure development in Amarkantak. Shri Chouhan stated that the resolution, which was taken by the state government to make Narmada river pollution free during the Narmada Seva Yatra will be fulfilled with the participation of the society. He mentioned that beside spreading awareness among the people of urban and rural areas situated on the banks of river Narmada, construction works are being carried out by the government. In this series, about 2 crore saplings were planted in the areas situated on Narmadas banks last year. Plantation will be carried this year too, he added. Shri Chouhan urged the people, not to release the sewer water in Narmada river and to come forward for water conservation activities. He laid emphasis on need for mutual efforts to maintain the purity of Maa Narmada. Member of Parliament Shri Gyan Singh, Chairman Scheduled Tribe Commission Shri Narendra Singh Maravi, MLA Smt. Pramila Singh, Chairman Amarkantak Development Authority Shri Ambika Prasad Tiwari and other Public Representatives were present on the occasion. Teachers Cadre Welcomes Chief Minister During the programme, Representatives of Teachers Cadre praised the decision taken by the Chief Minister Shri Chouhan recently in the interest of teachers and accorded heartily welcome to him. Shri Chouhan said that teachers must educate children diligently for their progress. Representatives of Teachers Cadre said that their aspirations have been fulfilled by the decision of the Chief Minister. We got rid of second class status, which we had in the schools and the society. M.P. becomes First State of Country in Door-to-Door Garbage Collection. Bhopal : The Influence of a Good Teacher can never be Erased, Teacher a source of love and inspiration. A great teacher can change your life. Teachers are the torch bearers of the gen-next. These are great thoughts were coming in each & every mind of the students when Teachers Day was celebrated today 5th September by the Campionites with full zeal and enthusiasm in the Loyola Auditorium of the Campion School, Arera Colony Bhopal. School had the same amount of feeling & fun that we would have had last year on teachers day. School Campus were gripped with fervour as Campion students put their best foot forward to pay tributes on the occasion of the birthday of the Great Philosopher, an Excellent Educationist, a True Humanist and a Great Visionary Dr. Sarvapalli Radhakrishnan who has indeed been a beacon, paving and showing the way to the teacher, who can bring about a positive change in a nation with just the right mixture of chalk and challenges. The programme commenced solemnly by grand welcoming the Fathers, sisters the Teachers & the guests by the primary & secondary section students. All the guests were accorded floral welcome followed by the lighting of the lamp. Lighting of the lamp done by Guests of honour Superior and Manager Fr. Christdhari kujur S.J., Principal Fr. Dr. Athnas Lakra S.J., vice Principal Fr. Ajay Kumar Kerketta S.J., Headmistress Sister Pramila A.C., Bursar Fr. Ashok Fr. Sylvanus, Fr. Kapil, Sr. Cresentia H.C., Sister Chitra A.C.
Bhopal : Lord Ganesha was given a grand farewell and the idols that were installed for the festival were carried to the nearby immersion sites and immersed with a lot of devotion and fanfare amidst incessant chants of the slogan: Ganpati bappa morya / Agle baras tu jaldi aa. 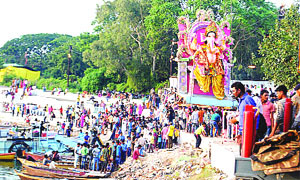 Hundreds of gigantic, large, medium and small idols of the elephant-headed god, Lord Ganesha, were taken out for immersion to various water bodies on Anant Chaturdashi, marking the end of the 12-day long Ganeshotsav in the city on Tuesday. Elaborate arrangements were made in Bhopal for smooth immersion of idols. The much-awaited immersion procession that marks the end of Ganeshotsav festivities was taken out with customary fanfare. Magnificent chariots bedecked with flowers, brass bands and devotees dancing with religious zeal were but a few of the things that ruled the roads on Tuesday, when the city bid a royal adieu to Ganapati Bappa. The immersion started from morning and continued till late night. Idols were immersed at Rani Kamlapati Ghat, Prempura Ghat at Bhadbhada and Khatalpura Ghat. Environmentally conscious citizens immersed small idols at the homes. Gayatri Parivar makes immersion arrangements Like previous years Gayatri Shakti Peeth Gayatri Parivar made immersion arrangements at MP Nagar, Kolar Road, Minal Mall, Coach Factory and other places. Ramesh Nagar of Shaktipeeth said we make Visarjan Kunds for devotees. The BMC put Visarjan Kunds in all the 85 wards so that the devotees could immerse their idols without any problem and keep the environment safe. 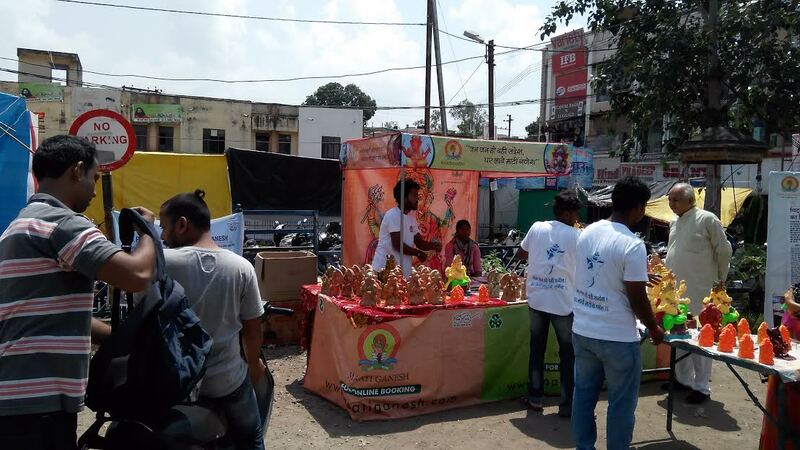 Hindu Utsav Samiti Under the aegis of Hindu Utsav Samiti, the chal samaroh was taken out from Nadra Bus Stand. 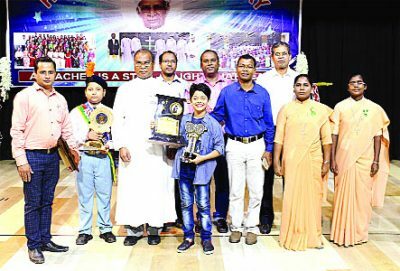 Silver crowns were given to Ganesh pandals and tableaux for the first, second and third places. BMC had made necessary arrangements at immersion sites. Cranes and dumpers were provided for the immersion of large idols. 10 - Day long Ganesh Utsav celebrations starts from Ganesh Chaturthi all over India.Ganesh pandals have been decorated with beautiful Idols all over the city. State capital Bhopal is ready to celebrate the Ganesh Utsav with joy and fervor. Daily Ganesh Aarti and prasad attracts the devotees towards the Ganesh pandals. During the 10 - day festival various cultural programme are also arranged by the Residential campus and Pandals. The festival will end on Ananth Chaturthi with the immersion of Ganesh idols. Aged 43, Abhishek is a career counsellor and civil services coach while brother Anuj is a writer and journalist. 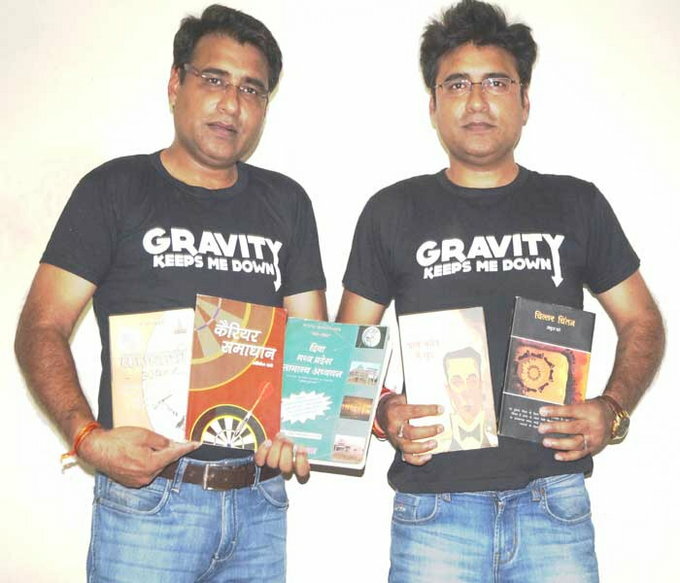 The twins have had five books published till date - three by Abhishek and two by Anuj. Books by Abhishek are Diva MP Samanya Adhayan (1998), Kamyabi - 30 Dinon Main (2004) and Career Samadhan (2008), while books by Anuj are Chillar Chitan (2009) and Param Shredhya Main Khud (2013) as per the Limca official website. This, however, is not the only feat by the duo. In 2003, they had made it to Limca for being the only registered Twins Club in the country. Currently, the club has 80-odd members. Abhishek said, "We tried for Limca book of records last year as well without success. But this year, we were fully prepared with supporting documents which earned us the feat." Three women riding a two-wheeler were intercepted by four bike-borne youths near Kaliasot dam. They allegedly sexually harassed the women and set ablaze their two-wheeler when they resisted to their advances. The incident took place on September 6. A case was registered at Nishatpura police station where the complainant resides. A case diary was transferred to Chuna Bhatti police station on Tuesday as the incident took place in its jurisdiction area. In another incident, a newly-married woman was allegedly harassed by a youth, who wanted her to walk out of her marriage marry him. The accused allegedly even beat up her brother when he tried to intervene. A case was registered at Hanumanganj police station on Monday, police said. In Chuna Bhatti case, police said they have some leads and accused would be nabbed soon. The victim is into marketing job. The incident took place when she and her two friends had gone to the dam for a ride. Hanumanganj police said the second incident took place when the 19-year-old victim was returning home with her brother in Qazi Camp area when accused Imran allegedly harassed her and beat up her brother. Reservation of wards under Bhopal municipal limits was held through lottery on Wednesday, the second time in as many months. Earlier , the wards were reserved for different categories through lottery on October 7 but it was struck down by Madhya Pradesh high court. Fate of Bhopal's 85 municipal wards was held through lottery much to the anxiety of local political leaders.A change in reservation status of the wards does affect the electoral prospects of the contensants. However, much to the relief of several leaders, the new draw did not change fortunes of many major political players in Bhopal Municipal Corporation(BMC). Status of 20 seats remained the same, as the draw held in October. However, in the new draw district administration was able to rectify an error that crept in last time during reservation of wards. Ward 85(Katara) was erroneously reserved for scheduled tribe (ST) candidate in the last draw which was corrected.BMC ward 60(Govindpura) was listed as an SC reserved seat instead, taking the total number of SC wards in Bhopal to 12. 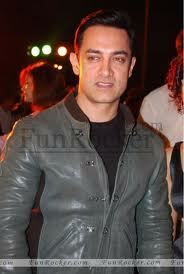 Bollywood superstar Amir Khan will reach Bhopal on Monday morning. He will be present at the show Bol Ki Lab Azaad Hai Tere orgnised by Action Ad Group at 10.30 in the morning. At four in the evening he will inaugurate the Gaurwi centre built in J.P Hospital in association with the women respect and protection campaign. States first escalator foot over-bridge will be completed till June 30. It is being constructed near Jyoti Talkies in MP Nagar, Bhopal. The 39 meter long and seven meter high foot over-bridge is being constructed at a cost of Rs. one crore 56 lakh. 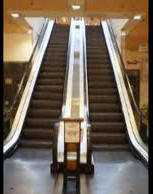 Besides, escalators, staircases will also be constructed on both sides of the foot over-bridge. This information was given by construction agencies to Urban Administration and Development Minister Shri Babulal Gaur here today. Shri Gaur also took stock of various other schemes also. Minister Shri Gaur inspected six-lane BRTS road being built from Board Office Crossing upto Misrod. Urban Administration Minister Shri Gaur sought information about railway over-bridge being constructed from Habibganj Naka Ganesh Mandir upto RRL Trisection from officers of concerning construction agency. The officers informed that process is underway to remove electricity lines and drinking water pipelines and construction of ROB will be started soon after this process is completed. The six-lane over-bridge will cost Rs. 38 crore 64 lakh. A two-lane road will also lead towards Ten Number Bus Stop. Shri Gaur also instructed for channelisation of nullah from Habibganj under-bridge upto Durganagar. Separate corridor for BRTS buses A 7.85 meter separate corridor is being constructed for low-floor buses in the 24-kilometer BRTS Road from Misrod to Bairagarh. Bus stops will also be built on both sides of it. The passengers alighting on these bus stops will press button of an electronic signal before crossing road following which vehicles passing through side roads will stop by seeing red signal and passengers will cross the road through zebra crossing. 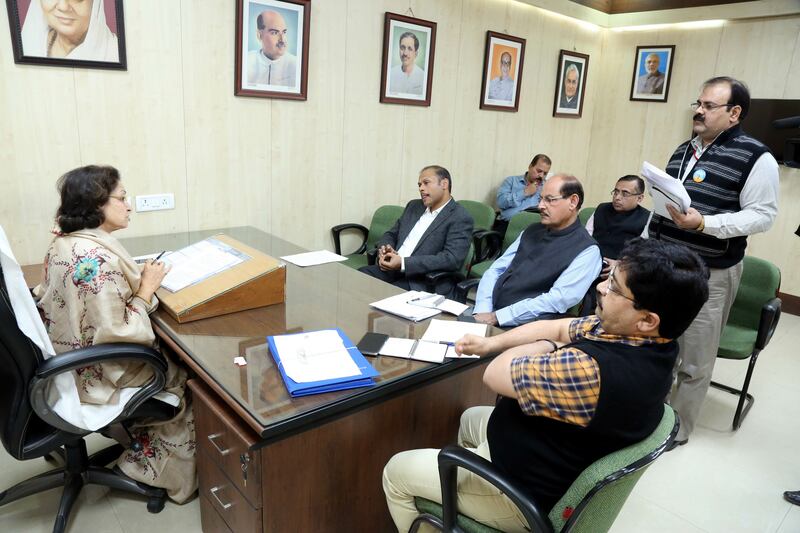 Minister Shri Gaur called for making people aware of this system and construction of attractive gates at the originating point of BRTS Road at Misrod and last destination Bairagarh. Minister Shri Gaur also took stock of houses being constructed for slum dwellers under JNNURM Scheme at Jatkheri. Shri Gaur instructed that houses should be allotted to beneficiaries as soon as they are completed. The Urban Administration Minister instructed for construction of boundary wall of Bagh Mughalia bus stand, shade at the bus stop of Raja Bhoj Nagar Bagh Sewania and arrangement of a water tank over there. Shri Gaur also instructed to elevate rostrums of Bagh Sewania subzi Mandi, construction of drains there and make arrangements for sanitary works in the night. Necessary security arrangements to be made at Shital Das Ki Baghiya Urban Administration Minister Shri Gaur also inspected Shital Das Ki Baghiya and gave instructions for making necessary arrangements over there. Shri Gaur instructed to install chains at the ghat for safety of people. It was informed that a grille will also be erected at the ghat so that people should not enter deep water. Barbed wires will be installed to prevent divers from diving into the lake from height. Arrangement for loudspeaker will also be made at the ghat for cautioning people. BHEL Traders Association president Shri Kewal Mishra and Commissioner Municipal Corporation Shri Rajneesh Shrivastava were also present on the occasion.